"Wait until 8" and other tips to reduce peak power usage.. Peak power is when demand is greatest, which means that the utility needs to use more expensive, and less green, power to meet the demand. The thing about peak power is that it’s all based on customer’s habits and routines. 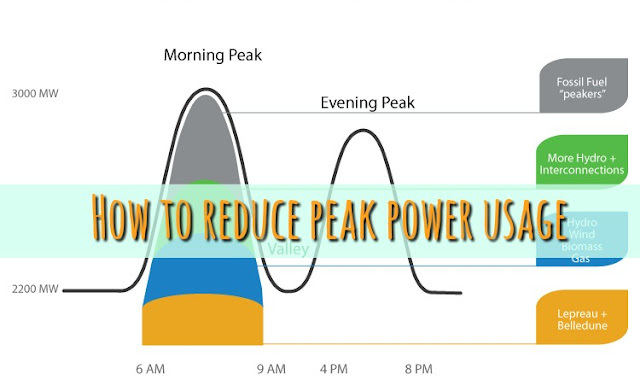 Peak power is from 6:00 to 9:00 a.m. and 4:00 to 8:00 p.m. These are the times that there is the greatest demand for power, although the morning peak represents the largest spike in power use. In the morning we’re turning up the heat, showering, and using appliances. Then in the afternoon we arrive home, turn up the heat, prepare supper, run the dishwasher, may be throw in a wash and put a load of clothes in the dryer. According to NB Power, spreading out the demand for power will save millions of dollars a year and save the utility from having to build more power plants in the coming years. Some jurisdictions have time-of-use rates for power so the cost per kilowatt of power is higher during peak times. In Peterborough Ontario, for example, peak power is 17.5 cents per kWh compared to 8.3 cents per kWh at off-peak times. Pricing that reflects the true cost of power is one incentive to change habits. Working to reduce our overall household power consumption is important but simply spreading our power consumption throughout the day will go a long way towards greening our environment and saving everyone money. The typical household energy consumption breaks down like this: 60% for heat, 20% for hot water, 15% for appliances and 5% for lights. For every degree you lower the thermostat during heating season, you'll save between 1 and 3% of your heating bill. (Programmable thermostats make this easier). A sweater is worth about 2 degrees in added warmth and a heavy sweater about 4 degrees. To make the most of your heat check that beds, couches and other furniture aren’t blocking radiators. Check your hot water heater to see that it’s set no hotter than 120 degrees. Install low flow shower heads for a more efficient use of hot water. Take shorter showers and consider showering in the evening instead of early morning. Limit or avoid hot water clothes washing. Cold water washes use 90% less energy than hot water washes and today’s detergents are formulated to work well in cold water. To reduce the amount of energy consumed by appliances, match your appliance size to your need. Ensure that your refrigerator and freezer seals are snug and that the rear coils are clean. Become less dependent on the clothes dryer and use a clothes line or drying racks instead, especially for large items that take longer to dry. Wait until after 8:00 p.m. to run your dishwasher.